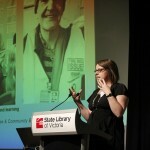 As part of Social Inclusion Week 2013, the Centre of Adult Education (CAE) in partnership with Adult Learning Australia organised a conference for over a hundred people at the State Library Victoria to consider the following questions. 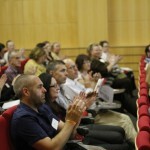 What does social inclusion in learning mean? How can we respond to the challenge of creating new spaces of opportunity for everyone? In his closing remarks, ALA President Barry Golding drew together and connected a number of overarching principles that emerged from a stimulating day of discussion and ideas. ‘It is important to learn from others and have conversations like this,including but beyond education, to make sense of our joint and surprisingly common endeavours. While we tend to split up what we do as either learning or education or health or welfare based on whatever our own education trained us to do: real people are best when they are whole – and not treated as having only one need, one identity, one affiliation and one outcome. ‘Learning is fundamentally about and facilitated by affiliation, in a group or program where people feel at home. Good learning is premised by social inclusion, and vice versa. ‘Learning is most inclusive when it involves learner agency: when people are empowered, not patronised from deficit or ageist models as students, customers, clients and patients. ‘Learning is best, wherever possible, where it is lifelong, lifewide and bottom up. But we operate in a system that otherwise tends to be market based, top down and mechanistic and which predetermines what a successful outcome is. So inclusive learning starts from what people know, can do and need to know, not premised only on what they don’t know or what we think they need to know. 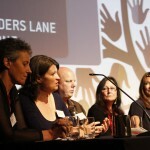 ALA’s Sally Thompson and panellists discuss what is socially inclusive learning. ‘A lot of what we have talked about today is first nature in many other societies, including many Indigenous communities. Maori writer Fe Day says cultural and social diversity, from a Maori perspective is like the diverse and interwoven strands in a mat. The closer and more inclusive we are, the stronger the weave the society and the richer the learning. We need to enjoy and learn fromdiverse peoples and patterns rather than creating separate learning mats. Our diversity is our strength and opportunity, not a liability.